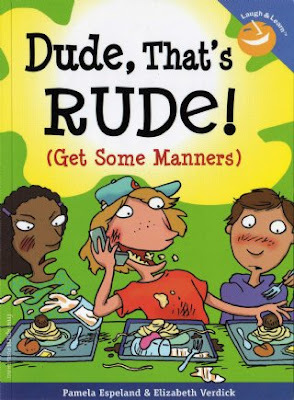 I highly recommend this self-help book to all the rude people in the world who I think are pitiful because they didn't grow up with parents or guardians who should have thought them social etiquette and courtesy. Maybe this is because their parents or guardians were also rude and disrespectful in the first place. Such a shame. There are so many rude people and there are so many rude gestures and acts but I would want to focus on how to be rude while on the phone. I wanted to make this list because I had several encounters with several rude customers talking on the phone while they order but not as rude as this one. Imagine, here comes this black person come in through the door yapping on his phone. I greet him he's still busy yapping on the phone. I wait for him to finish his conversation or ask the person on the other line to hold but that never happens. I start to do some other thing other than waste my time waiting for him talking on the phone. Then he tells me what he wants without even saying please or whatever then I punch it in and asks him for clarification what he wanted because he doesn't speak English that well, he might be from Africa or something. Moments later he comes back he comes back telling me that I made a mistake and then I tell him that I asked him two times but he wouldn't listen to me because his phone was stuck to his ear for some strange reason. He then tells me, "You shouldn't talk to me like that I'm a customer bla bla bla" and threatened me that I'd lose my job. Actually I didn't take this seriously because losing my job at Tim Hortons won't be an earth shattering event. Even the other customers told me that I was right for telling that black guy off that if he wasn't talking on the phone his order would have turned out right. Phones were invented to facilitate better communication between two people and to bridge the distance between them. But if phones will make you lose your ability to communicate and interact with the people already around you then phones become a nuissance rather than a tool to improve our lives. 1. Talk on the phone while ordering and make everyone in the line and the person taking your order to wait for you to finish whatever you are doing. 2. When on the phone, make sure that you talk loud enough for everyone to hear your conversation. It would be even better if you turn on the loud speakers. People will really get the attention. 3. When you are talking with someone and the phone rings, make sure to answer the phone even if it is unimportant and make sure to apologize to the one who called you for taking time to pick up the phone and completely ignore the person who you were talking to in front of you. 4. Make sure that your ring tone is at the maximum level of loudness and never put your phone in silent mode when you are in the movies, church, and while you are in class or board meetings. 5. Scream and completely lose it when someone says excuse me to you and talk to you while you are on the phone. How dare they interrupt you! 6. Always be sure to talk on the phone while you drive or do anything else. Every one else can just move out of your way and give you more consideration because you're on the phone.